1. 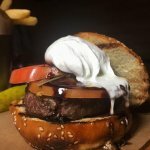 Cook your Burger to order (medium rare is the way to go to bring out the most flavor and provide a juicy bite). 2. 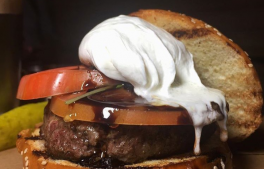 Place Burger on Brioche Bun and top with Basil Leaves, sliced Heirloom Tomato, and Burrata Cheese. 3. Drizzle Balsamic Reduction and Extra Virgin Olive Oil. Add Smoked Maldon Sea Salt to taste.